Sets up in minutes. Includes 12 different slides including hearts, snowflakes,shamrocks,halloween bats and witches, fall leaves, balloons, stars, fireworks, butterflies, easter bunnies, prancing deer, and white dots. Leaves, hearts, shamrocks, balloons, fireworks, and butterflies are projected in color. Fun for 365 days a year! 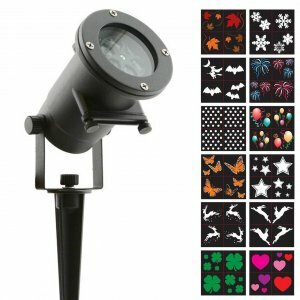 Night Stars Celebration Series LED motion projection lighting system displays a kaleidoscope of fun, festive, and interchangeable images. Create an enchanting experience for every occasion, from Christmas and New Year’s to Halloween and Saint Patrick’s Day. Made for year-round use, the projector’s specially designed slides are easy to use and transform any area in seconds! Display the images in a fixed position or at 3 different selectable motion speeds. Ideal for interior and exterior walls, on the front of your home, landscapes, pools, gazebos, and more! Be the hit of your neighborhood, year round. Made of Cast Aluminum for durability. (not plastic). Guaranteed to enjoy! !